This is the fiftieth anniversary of a hi-fi legend. It was 1957 when Quad stunned the hi-fi world by introducing the first full-range speaker based an electrostatic (as distinct from the usual electro-dynamic) principle of operation. That original Electrostatic (for that was its formal name) stayed in production for more than two decades. Its successor, codenamed the ESL-63 (because work started in 1963), didn't actually appear until late 1981, and remained perpetually back-ordered until the mid-1990s, when it became impossible to build within modern safety standards. Come the millennium, with the brand stabilised under IAG control, the electrostatic speakers had gone back into production, with two models rather than one. The ESL-988 and ESL-989 were based closely on the ESL-63, while incorporating a number of changes, partly to satisfy safety legislation, and to strengthen the speaker mechanically. Further development work since then has served up two new versions - the ESL 2805, plus its bigger '2905 brother. Both models now have substantial steel and alloy frames, extended fabricated steel bases fitted with 8kg mass-loading billets, and a hefty strut that braces the top of the frame against the back of the base, and there are further improvements to the baffle plates and their mountings. While it's exceptionally slim when viewed from the side, like any panel speaker it's also very bulky from the front, standing just over a metre tall and more than two thirds of a metre wide. Apart from the silver alloy extrusions that form the sides, and a curved gloss-black top, most of this is black grille, creating a sombre monolithic effect, but a gilt edge/brown grille classic version is also available. Decoration is limited to an illuminated Quad logo near the base on the front, which can be turned off. Electrostatics operate on a totally different principle from conventional moving-coil drivers, generating their sound output from a series of large panels of ultra-light plastic film - six in the 2905, four here - stretched between high voltage charged plates and all working as one big panel. This distinct approach has numerous consequences, the most significant being that the panel radiates sound equally forwards and backwards, but the radiation of each is out of phase with the other, so where they mix (at the sides), they cancel each other out. It's known as dipole or doublet operation. This front-to-back cancellation also means that the absolute bass extension is actually determined by the width of the panel. Dipole operation results in a figure-eight sound radiation pattern, rather than the substantially spherical pattern created by a conventional box loudspeaker, and this has several implications. The sound is delivered forward and back, but much less goes up, down or to the sides, resulting in a high direct-to-reflected sound ratio. It also allows the speakers to be placed close to side walls. This latest ESL features improved materials for greater mechanical integrity and sonic transparency, but at its heart is still Quad's extremely clever 'delay line' approach, originally introduced in the ESL-63. The problem with any large-area diaphragm is that it will radiate higher frequencies in an increasingly narrow beam, whereas the ideal would be to maintain constant directivity at all frequencies. 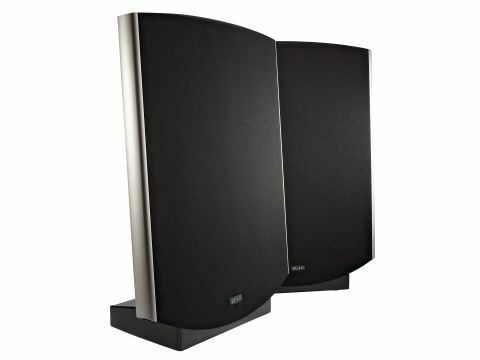 This is a major reason why most speaker systems have two or more drive units, the addition of a tweeter providing wide directivity at high frequencies. The Quad design is different: it may sport two outer panels flanking a pair of smaller central panels, but these elements are fed the same frequencies and there are no 'treble' and 'bass' units... and no need for a crossover. All Quad electrostatics (from the ESL-63 onwards) have eight concentric rings in the two centre stators, connected via delay lines that progressively delay the feed to the larger, outer rings. This allows a flat diaphragm to mimic a point source one-third of a metre behind the speaker itself, with the highest frequencies generated from the innermost circle outward. In other words, the speaker attempts to recreate a notionally 'perfect' transducer. Because the electrostatic 2805 operates on an entirely different principle from regular dynamic speaker systems, all the rules are changed, and a totally different set of compromises emerges. In some respects, the 2805 sets a performance benchmark that even the most costly regular speakers can only dream of approaching; in other respects it has obvious and exasperatingly recalcitrant limitations. Providing your choice of music and listening levels suit its strengths - and for many that will be the case - the 2805 is one of serious hi-fi's greatest bargains. It's unquestionably best at reproducing acoustic instruments (including voices), but has its limitations in both loudness capability (partly due to very low sensitivity) and deep bass reproduction (as a consequence of dipole operation). Because there's no box, there's no boxiness. And because the actual weight of the Mylar film diaphragm is less than one hundredth the weight of even a light driver cone, and is effectively evenly driven across its entire surface, it is exceptionally responsive to even the tiniest signals. Furthermore, because the diaphragm is large, and therefore makes only tiny movements, linearity is high and distortion very low. Changing over from a conventional speaker to the 2805 can be a little disorienting, because the differences in presentation are dramatic. This speaker has the most stunningly gorgeous midband you're ever likely to hear, combining remarkable neutrality with great expression and delicacy. There's also an inherent sweetness here that results from a splendid freedom from any exaggeration or hype. The 'Quad' sound has wonderful coherence and unusual phase-accuracy, bringing remarkable realism to human voices, and creating exceptionally precise stereo images. Piano and woodwind reproduction also stands out as startlingly realistic, though brass can get a little edgy. However, these observations could well relate as much to the sources, amplification and ancillaries being used as the speakers themselves, as the 2805s proved exceptionally sensitive to components further up the chain. Contributing to the pin-point imaging is the fact that dipole speakers have a much higher direct-to-reflected sound ratio than monopole box loudspeakers. In other words, you hear more of the actual recording, and less of your listening room. The pinpoint imaging is most impressive, but there's still some beaming of the very highest frequencies here, so best results are obtained when the listener is seated directly on the forward axes - and there's really only one 'best seat in the house'. While much of this speaker's sound is deeply impressive, there are some limitations. The bass extension is defined by the width of the speaker here, and limited to around 50Hz, so the bottom octave is not on the agenda. It might be possible to supply the extra bass octave with some form of subwoofery, but this is far from straightforward, as the Quads are velocity transducers, whereas most subwoofers are pressure devices. Attempts to use two of REL's new T-series subwoofers did not prove successful. Despite the limited extension, the bass reproduction of the Quads alone is qualitatively good - crisp and clean, with no overhang, though it could be more even, and one wonders whether some means of lifting the whole speaker 10-20cm or so off the ground, leaving free air underneath, might be advantageous. The 2805 has both low sensitivity (around 84dB) and relatively modest power handling (though sophisticated electronic protection ensures that accidental overload won't cause any damage). This is not therefore the ideal speaker for those who like their rock music loud and dirty, but in contrast its low level performance is utterly entrancing. One day the BBC in its wisdom chose to broadcast Verdi's exceptionally dynamic Requiem after 2am, when serious levels are totally impractical. But the 2805 performs masterfully even at whisper quiet levels, and the rich texture and detail came through beautifully. Within acknowledged loudness and bass limitations, this genuine 'high-end' reproducer sets the standard for natural realism of voices and acoustic instruments. Not a great rocker, but imaging, coherence and low-level detailing are exceptional.